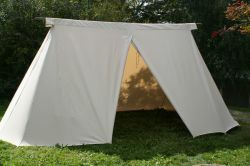 The Norman Tent is a side opened “ridge pole-tent” out of the Early Middle Ages. Sometimes you can also find it under the name Saxon tent. It served predominantly as a mobile accommodation of the armed troops. The Norman Tent was used predominantly by the Saxon and the Vikings. Our reproduction with the entrance in the middle of the side wall is timed about the 12th century and definitely seen in the so called Anglo-Catalan-Psalter. 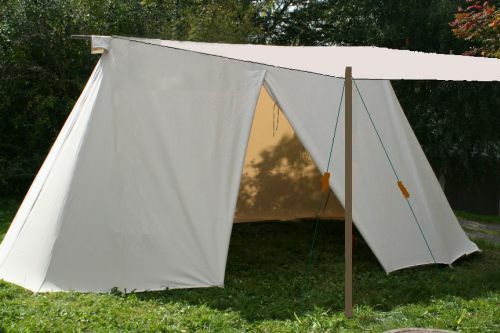 This tent is available with the entrance either overlapped or round. The tent can be produced with or without bells. The gable is opened standard, which means that at each ridge end is a vent, if desired also closed available. At the lower border of the tent are mud flaps.